After a hectic summer, we here at Soundproof are slowly getting back into the groove. 'How are we going to do that?' you might ask. We're going to offer up tickets to one of our favorite bands of all time: The Magnetic Fields. I know right? And all you have to do is comment, like, or tweet for a chance to win them. Comment on this post (sorry, no anonymous comments please - we need some way to reach you if you win!) and tell us your favorite MF song; like us on facebook (www.facebook.com/soundproofblog) and post your favorite MF song on our wall; mention us on twitter (@soundproofblog) with the hashtag #winmagfields and drop your favorite song in the tweet. That's three ways to enter. But wait, there's more! We'll be tweeting our love of the Fields all week; retweet three of our tweets and get a fourth chance to win. We are super excited to offer this opportunity and we hope you all are super excited to participate for you chance to win! If the winner is a budding music blogger, we'd also love to have a guest post. 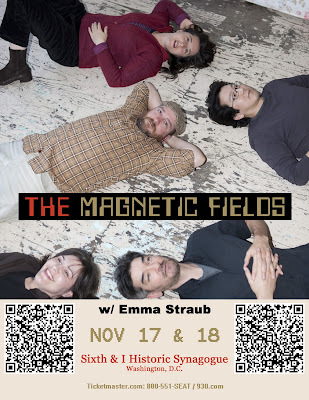 How to Enter: Comment here with your google account; like us on Facebook (www.facebook.com/soundproofblog); mention us in a tweet about your favorite MF song (#winmagfields); or retweet three of our Fields-related tweets.